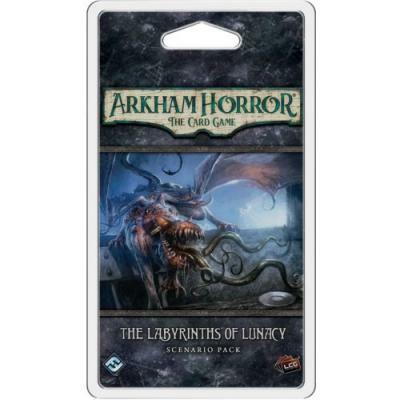 HomeCard GamesArkham Horror The Card GameThe Labyrinths of Lunacy: Arkham Horror LCG Exp. The Labyrinths of Lunacy: Arkham Horror LCG Exp. The Labyrinths of Lunacy is a unique, 80-card scenario. You and your fellow investigators are the prisoners of a mysterious mastermind - locked into a terrifying dungeon and forced to complete a series of twisted riddles to find your way to freedom. This scenario debuted at Gen Con 2017 and can accommodate as many as twelve investigators in its Epic Multiplayer Mode. Additional rules support standard tables and allow you to experience The Labyrinth of Lunacy as a three-part mini campaign.